“Steam is this painting’s great subject, clearly; and how people relate to steam, how they face it or do not face it; how they turn to face us. It does not take much ingenuity to see that steam in the Manet is a metaphor for a general, maybe constitutive, instability – for things in modernity incessantly changing their shape, hurrying forward, dispersing, and growing impalpable. The picture is perfectly conscious of the fact that their doing so is deeply appealing. It is a sight for sore eyes. We all like watching the trains go by. But steam in Le Chemin de fer [French title] is also a figure for that shifting and impalpability getting into the texture of life. Steam is a metaphor for appearance, and appearances here being transitory, and for some reason also thoroughly guarded. Steam is the surface that life as a whole is becoming. The girl and the governess are put in a space that is more like a cage than a terrain vague. From railings to picture plane there are no more than two or three feet. T.J. Clark, “Modernism, Postmodernism, and Steam,” October, vol. 100 (Spring 2002): 158-9. 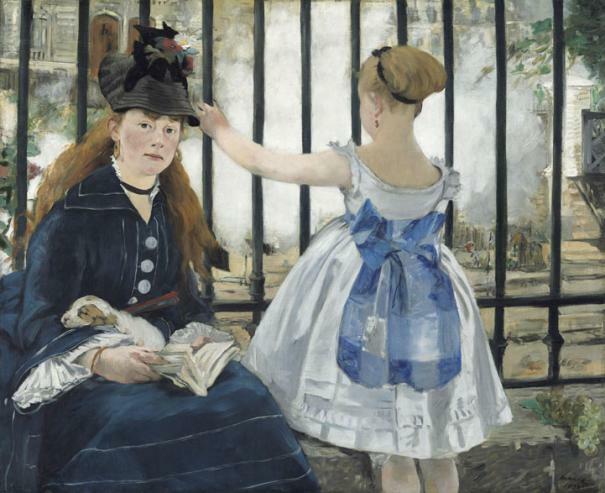 Françoise Cachin, “The Railroad” in Manet 1832-1883. Exhibition catalogue (New York: The Metropolitan Museum of Art, 1983), p. 341. Theodore Reff, Manet and Modern Paris. Exhibition catalogue (Washington, DC: National Gallery of Art, 1982), pp. 56-7. "It is hard today to convey the significance and implications of the timetable, which first appeared in the early 1840s: for the organization of the railways themselves, of course, but also for the daily lives of everyone else. The pre-modern world was space-bound; its modern successor, time-bound. The transition took place in the middle decades of the nineteenth century and with remarkable speed, accompanied by the ubiquitous station clock: on prominent, specially constructed towers at all majorstations, inside every station booking hall, on platforms, and (in the pocket form) in the possession of railway employees. Everything that came after -- the establishment of nationally and internationally agreed time zones; factory time clocks; the ubiquity of the wrist watch; time schedules for busses, ferries, and places, for radio and television programs; school timetables; and much else -- merely followed suit." "Bringing a railway line into a large town or city was a monumental challenge. Beyond the technical and social issues -- the clearance or removal of whole districts (usually the poorest...), the bridging and tunneling past urban and natural obstacles -- there was the implication of placing at the heart of an old city a new technology, a substantial ediface, and a steady, daily flow and ebb of many tens of thousands of people. Where should stations be placed? How should they be integrated into the existing urban fabric? What should they look like?" Tony Judt, "The Glory of the Rails," The New York Review of Books, vol. LVII, no. 20, (23 December 2010-12 January 2011): 60 & 61.